The research on the benefits of reading to your children is everywhere. I know we were better at reading to our older two than we have been with our youngest and I’m trying to get better at that. 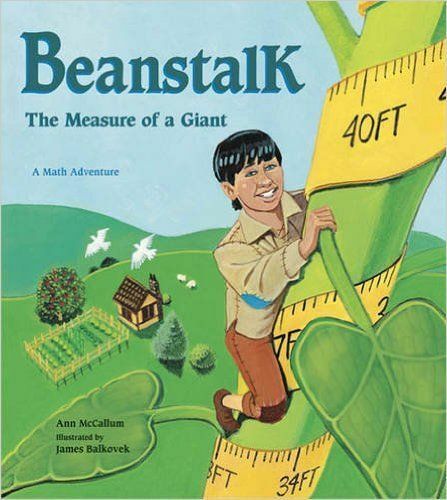 With that said, I was happy to review one of Ann McCallum Books called Beanstalk: The Measure of a Giant. This book is so neat! It’s a spin on the Jack and the Beanstalk story that we all know and love. In this one, Jack becomes friends with the giant, but they find it hard to play together because of the size difference. Using math, they figure out what sizes they need to make things so they can enjoy each other’s games. Jack figures out that the giant is 5 times taller than he is and he makes a huge checkerboard by measuring his own checkerboard and then multiplying it by 5. When they played checkers, Jack just sat on the table! Olivia’s favorite part in the book was when they played hoopball (basketball) together! The hoop was WAY too high for Jack, so they used math to figure out what height Jack’s hoop needed to be. Then, they played hoopball with two hoops! The math in the book is definitely too hard for Olivia (age 7) to grasp on the first time reading it. However, I feel that the more we read it, the more she will get it. And for my 11 year old boy, I think it was cool for him to see how you can use math in “real life” to help you figure things out. What is it? A book by Ann McCallum Books called Beanstalk: The Measure of a Giant that uses math to explain the things going on in the story. Thanks so much for sharing this, Nicole. I’m delighted to hear that both your kids enjoyed the story (and the math!). They do! My youngest wanted to use it as her book in a box book! Thank you for taking the time to read my post!